Kevin Harvick will seek to make it back-to-back Sprint Cup titles in 2015. 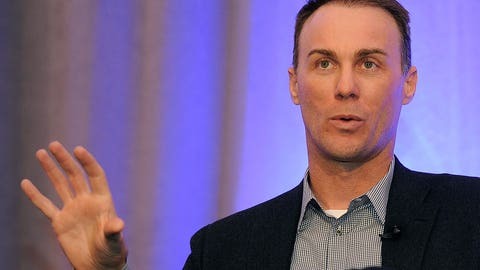 Defending NASCAR Sprint Cup champion Kevin Harvick has certainly been busy this offseason, but the Stewart-Haas Racing driver is rested and ready to go for the start of the 2015 season. Coming off his dramatic championship victory at Homestead-Miami Speedway, the driver of the No. 4 Chevrolet has been on the go doing media tours and making appearances on late-night television, as well as taking in a variety of sporting events. During Thursday night’s Charlotte Checkers AHL hockey game, Harvick told FOXSports.com that being called the Sprint Cup champion at each stop, and sharing incredible experiences with his son, Keelan, have been the most enjoyable part of the entire experience. "Just being able to represent our sport as the champion, and our team as the driver of the championship team, is pretty special," said Harvick. "For me, I always try to stay as busy as possible, just because you don’t want to fall out of the routine you have during the season. We’ve had a lot going on, but looking forward to getting back in the car." Heading into the 2015 season, Harvick believes the No. 4 team is "leaps and bounds" ahead of where it was going into the 2014 season, its first together as a group. Now with a cohesive, championship-winning team, Harvick is confident they have what it takes to back up last year’s performance. Adding to that confidence is the assurance of knowing his pit crew from the final 10 races of 2014 will remain the same for 2015. "All in all, I feel good about it. I feel better about it than I did last year, for sure," Harvick said of his outlook for the 2015 season. "There’s just so many unknowns and so many things that can be different. As we go into the year, you just have to adjust to wherever you are at the beginning of the year. Last year we won the second race, we didn’t have anything real stellar happen after that finish-wise, but we ran really good. All in all, I feel good where everything is at." Harvick’s teammate, Kurt Busch, took part in last week’s NASCAR-sanctioned Goodyear tire test at Las Vegas Motor Speedway, but the defending series champion has been so busy, he has yet to dig into the details of the test. "I know they said the cars ran well and had good speed," Harvick said of the tire test. "That’s the only thing I wanted to hear, really, because there are so many different tires and so many different variables that there’s really not too much to take out of it because Goodyear changed so much at the test." Prior to last season, Harvick, crew chief Rodney Childers and the entire team scrambled to build cars, come together as a team and get ready for preseason testing at Daytona. With NASCAR’s ban on testing this year, the team has been able to relax a bit more, while using the downtime to spend time with their families. "This year it has allowed everybody to catch up on what they put off last year, the sacrifices that everybody made with their families to not go on vacation and all the things that had to happen last year to get done," said Harvick. "This year allows them to get that time to make sure that everybody and everything at home is prepared. "That’s just as important as anything we do, to make sure that home is balanced with work," he added. "That can affect things more along the year than being off on the racetrack. It’s just attitudes and family life. I think everyone has been able to maintain the family schedule they need to make things go around." With confidence on his side, a team that is well-rested and the swagger of being called the defending Sprint Cup champion, Harvick appears to be on track to pick up in 2015 where he left off in 2014 — at the top.